WE ARE OPEN ON CHRISTMAS DAY AND BOXING DAY!! Our working Lunch menu is simple, yet delicious option. 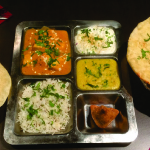 Reasonably priced menu offers trouble free authentic curry experience to your door step. Working Lunch menus can be ordered for a minimum of 10 people. All you need to do is let us know how many number of Option 1, Option 2 or Option 3 would be required with a choice of drink at least one day before the delivery. Please note food may contain traces of nuts. Please inform us of any dietary requirements when placing your order.